SM Series rubber based adhesive mounting tape designed for indoor applications or light duty applications with no UV exposure. Available in white or black foam with a bleach white paper release liner. 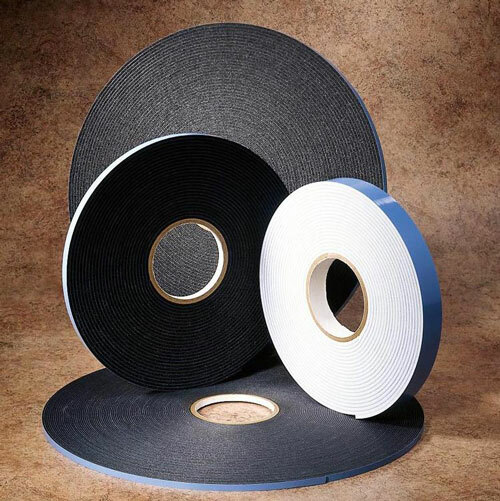 AM Series, permanent acrylic mounting tape provides long-term bonding, moderate UV resistance, and higher shear and tensile strength. Available in white or black foam with a blue poly release liner. EM Series extreme bonding tape is perfect for applications that require high bond strength, extended UV exposure or water resistance. Available in light grey, charcoal or black with an unbleached paper release liner. Foam mounting tape is used to attach nameplates, signs, small displays and more. Double stick tape is also used to hang items on interior and exterior walls and other surfaces. Use double sided foam tape instead of screws, nails, bolts and other mechanical fasteners. Adhesive foam tape provides consistent reliable bonding even in applications with irregular surfaces without wearing out over time. Double sided foam tape is applied using a simple peel-and-stick adhesive backing. LAMATEK supplies foam mounting tape with adhesive on both sides and a release liner on one side. This makes it simple to peel the tape from the roll and stick it to one surface. Then you can remove the liner(s) to bond the second surface. SureMount® double sided foam tapes are used in a wide variety of industries for attaching and mounting applications. Select any of the markets below for more information.